On stage at the 2018 Choctaw Nation Veterans Day are Chief Gary Batton and Nuchi Nashoba, as Chantelle Standefer sings The Lord’s Prayer in Choctaw and Little Miss Choctaw Nation Mia Reich, left, and Jr. Miss Choctaw Nation Kalin Beller perform in Native sign language. TVSHKA HOMMA, Okla. – The Choctaw Nation hosted its annual Veterans Day Ceremony Nov. 10 in Tvshka Homma. The event is always a special time for the Choctaw people to come together and honor fellow tribal members who have served in the U.S. Military. Chief Gary Batton informed the gathering that a Choctaw soldier, missing in action during the Korean War, had been located and identified. The body of Charles Gibson Kanotobe, Chief Batton explained, was being returned to his hometown of Idabel for burial the following week. Family members of Konatobe were in attendance and were recognized with a standing ovation. Chief Batton also gave special recognition to the Choctaw Color Guard that posted the flags, fired a 21-gun salute and performed Taps at the Veterans Day Celebration. This year also marks the 100th anniversary of the World War I Choctaw Code Talkers. Nuchie Nashoba, president of the Choctaw Code Talkers Association, said, “We as a people need to continue teaching our children and our grandchildren the value and importance of faith, family and culture. We as memory keepers of the Choctaw Code Talkers will continue to keep them alive so that generations to come will know about the sacrifice, commitment, and dedication these men had so that we as Americans can still be free.” Nashoba added that the association has been busy this year with speaking engagements, the placing of a granite monument in Antlers and renaming bridges in southeastern Oklahoma after America’s first Code Talkers. More than 1,300 people were in attendance for the event, according to Roger Hamill, Deputy Director of Choctaw Nation Veterans Advocacy. 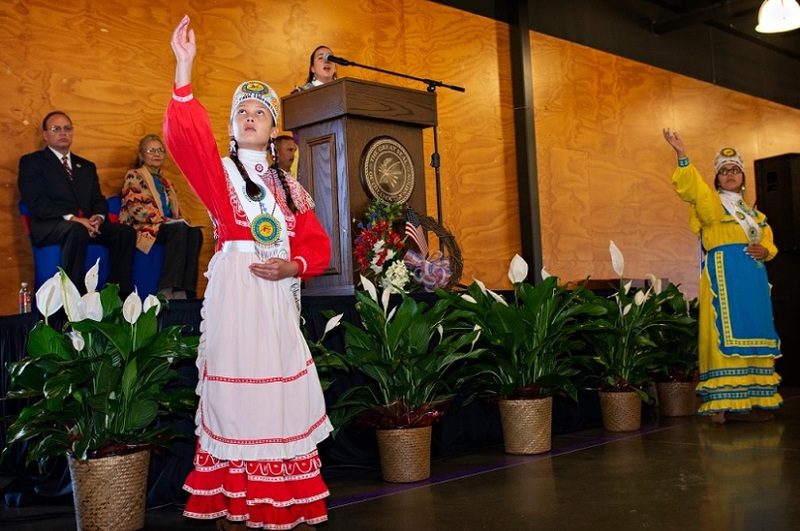 The program included Chantelle Standefer singing the National Anthem and Lord’s Prayer in Choctaw and Choctaw Royalty performing Native sign language. Also speaking was retired 1st Sgt. Dale Cantrell, who offered a colorful personal history of his career in the U.S. Army that encompassed the Vietnam Era.